Previously I was using JTR Nest to counter Revan, this is obviously no longer an option and I’m need in of a team that has comparable winrates against the zRevan, zJolee,Bastilla, GMY, GK meta. Can we get a discussion happening? I know there was an older topic but that’s no longer relevant given the changes to Nest. Droids - never tried, how effective? Are there any more than might score a 80% win rate against the Revan meta? Put tenacity mods on Nest so that she resists the max health reduction. Are you sure it can be resisted? Plus, now she won't gain the bonus protection as she used to, so its not an option. I think the problem might be Bastila’s basic which gets +100% potency, but idk. Yup. Also, Legendary Battle Meditation gives +50% potency to all Jedi at the beginning of each turn Bastila takes. Coming from someone who has a raven and I can climb in the top 2-5 daily in my arena shard (if I’m not being lazy), barring Horid rng. Of all the teams in the arena , There’s is only two raven teams i can’t seem to beat in the top 10 due to their crazy mods on each and every toon. Raven team is great on offense. I fall into the high 20s daily on defense. 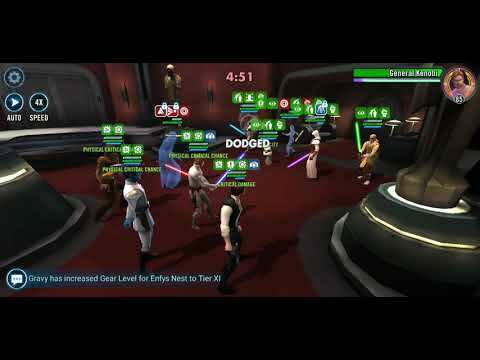 On attack, I will tell you I never had an issue vs. nest on any team and never had an issue with treya (kill order is treya then sion then thrawn) . Save nest for last (on any team) and she’s toast Albright slow or fast . Honestly the most difficult team I find to battle that are non ravens with godly mods are the well equipped nights sister teams . I cringe at having to battle them because what you thought was in the bag can turn on you in a split second. And obviously I say all that because if you are attacking with a nightsister team it’s probably the best option since they are so difficult on defense . I use NS effectively against Revan teams in the top 5. Thanks Chris, can you breakdown your strats and link your swgoh profile? I do not currently have video of me vs a 300+ Revan, but I will work on it. My strat depends honestly on whether or not they are using GK, with him they are a little tougher to beat without him they are cake. You're seeing Revans with no GK? Can I switch to your shard? Theres one of the top teams in my shard that go without a tank. It's much of a muchness to me (I use traya). Does Dark Bastila work on a EP team against Traya or Revan? I dont have either. 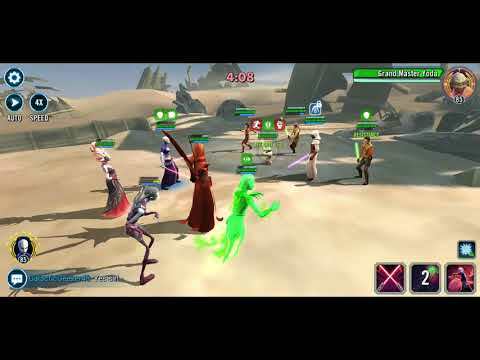 I can beat single tank Traya teams with my Scoundrels. Revan and double Tank Traya are still hit or miss - mostly miss. Nest still works under a very fast vandor. Health and protection does not matter if the revive is constant. How fast? Mine is 238 I think. I thought vet chew would be a good nest replacement, but he is too slow. So many crits...has anyone tried with the ol'good zBarris? And you can't develop something since launch that includes no launch characters (I think, I wasn't around at launch so I'm not sure about Han). 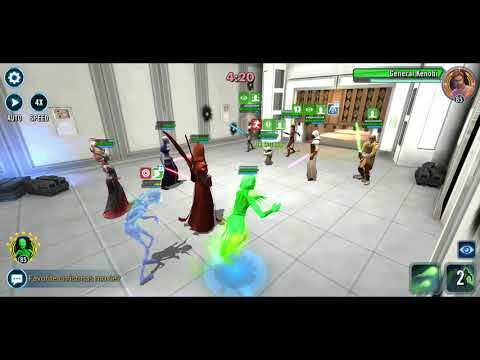 Here is a video of my NS vs a 304 speed revan, i'll have to work my way back to top 10 in order to get ones with 314 speed and such. So I will keep working on it, I chose the middle team because the other Revan team only had a 294 speed. All my NS barring Old Daka Has a full set of 6* Mods, Old Daka currently only has 1 soon to be 2 6* mods. Exact same. I watch the overall speed of the other teams. As long as vandor gets prepared before nest dies, all is goodish.... the longer revan has been around the better the revan teams get. Interesting! This doesn't hold on defense though does it? Why DN? Just to trick the AI into attackin him? 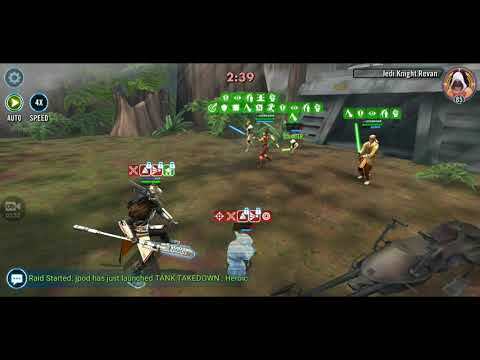 Here is one against a 309 speed revan and a GK with 70k+ protection. I always focus Yoda first as much as I can, cause he's easiest to kill. I have one against a higher speed Revan but fiance and I were fighting and she texted me a couple times mid battle so gonna edit the text messages out and upload it tomorrow. Interesting comp, so you have 100% win rate against Revan with that team? What sort of mods are you running? My shard has “that” squad. Revan Bastila GMY HY Jolee.